With its aromatic, bright, and showy long-lasting flower clusters Phlox paniculata has become a staple in today's landscapes. Garden phlox is one of the most recognizable and widely grown perennials. Recent breeding efforts have brought several improvements to this already popular species of perennial plants including a wide range of flower colors available, improved plant habit, and increased resistance to diseases. Garden phlox is the backbone of the summer perennial border and is also a great perennial for open sunny locations. The striking and fragrant trumpet-shaped flower clusters appear in the mid-summer and always deliver a spectacular display of color when they are blooming. Today's cultivars produce a wide range of flower colorations consisting of various hues of lavender, orange, pink, purple, red, salmon, scarlet, and white. Many cultivars have contrasting colored eyes or bicolor blooms. The genus Phlox was named from the Greek word phlox which was the name used for Lychnis by Theophrastus. Garden Phlox are generally hardy throughout Zones 4 to 8. However, several cultivars are hardy to Zone 3 and some of them can survive the heat of Zone 9. The plant height when blooming varies widely by the cultivar and ranges from 15 to 48 inches with most varieties reaching 24 to 36 inches tall. At maturity, garden Phlox forms clumps 24 to 36 inches wide. Tall Phlox prefers to be planted in locations with moderately fertile, well-drained soils. They do not perform well in locations with poor drainage or soils that remain constantly damp. Garden phlox prefers full sun, but also grow well under partial shade. In the South, it performs best when afternoon shade is provided. 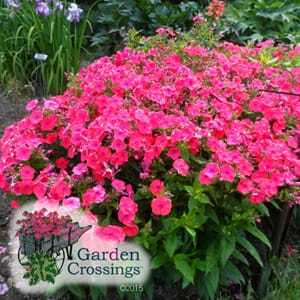 Phlox are easy to grow and only require few maintenance activities. It is recommended to remove the flower heads when they are done flowering. Taller cultivars may need additional support from cages or staking to prevent the flower clusters from lodging. To reduce the occurrence of powdery mildew, thin or divide large clumps every year or two to improve the air circulation around the plants. Some of the most common insect pests that may be observed feeding on Phlox include aphids, beetles, caterpillars, grasshoppers, leafhoppers, leafminers, and spider mites, whiteflies. Most of these pests, under normal circumstances, do not cause significant injury to garden Phlox. Garden phlox are susceptible to several pathogens including fungal leaf spots, powdery mildew, and stem canker diseases. Of these diseases, powdery mildew is observed most frequently. There are great differences between cultivars in their susceptibility to powdery mildew. Even highly resistant cultivars may succumb to this disease under severe or optimal conditions for disease development. This occurrence of this disease can be reduced when the plants are planted in areas with good air circulation, the plants are not crowded, and by avoiding overhead irrigation (wet foliage). Garden Phlox are commonly used as accent or aromatic border plants. They are also resistant to deer. This Native American perennial attracts butterflies and hummingbirds into the garden. Phlox makes and excellent cut flower and offers an excellent vase life. Many of the smaller cultivars make nice container or patio pots. Phlox combine nicely with other garden Phlox cultivars and numerous sun loving perennials such as Agastache, Coreopsis, Echinacea, Euonymus, Gaillardia, Hemerocallis, ornamental grasses, Nepeta, Penstemon, Perovskia, Physocarpus, Rudbeckia, Salvia, Sedum, and Weigela.